CD & CD-R, SACD, DVD & DVD, Blu-ray Two years in development, a powerful and proprietary new composite material has been crafted by Marigo Audio using an embedded carbon nano-tube structure which dramatically reduces levels of disc vibration. The Evolution Signature Mat incorporates unique hand laid-up polarizing filaments creating tremendously rapid vibrational energy decay and a new ultra-thin metallic coating which dissipates static build-up in real-time while the disc is spinning. For maximum fidelity, a subtle but audible further sonic enhancement is achieved by orienting the Evolution Signature Mat in relation to the direction of the label on the disc being played. 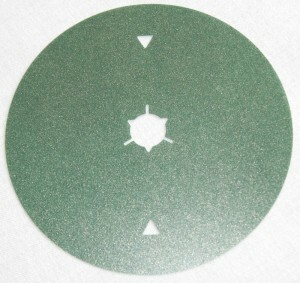 The vibrational patterns on the top surface of the disc that build up during play are changed from a random to a polarized orientation by the effect of the linear geometry on the disc label. The additional sonic improvements from accurate orientation of the Evolution Signature Mat is directly caused by the highly efficient vibrational energy conversion to heat by the internal filaments in the Evolution Signature mat crossing perpendicular to those micro-vibrational patterns set up on the disc. This concept and procedure is a new experience. Marigo Audio created it. It is easy for all to test the efficacy of this process simply by listening to the Evolution Signature Mat aligned or not aligned using any production disc. Hear what truly minimizing disc vibration can do for the music. Additionally, the new Evolution Signature Mat is half the thickness of the previous generation 3-D Signature v2 Mat. Our new materials technology and additional design advancements offer significantly upgraded performance over the 3-D Signature v2 Mat. Marigo Audio Evolution Signature Mat. MSRP $199usd. Available now. The Evolution Signature Mat comes with an unconditional 30 day satisfaction or full purchase price refund guarantee. This product carries an unconditional 5 years warranty to the original purchaser, covering all conditions, including damage and breakage. Please purchase the Evolution Signature Mat from your preferred local audio equipment dealer. If you do not have a dealer who carries this product, please contact Marigo Audio for direct sales. Paypal and credit cards are accepted. AND REPLACES THE EVOLUTION SIGNATURE v2 MAT. customer comments The Evolution Signature mat wrought positive improvements from my Mark Levinson Reference 31.5 transport. The focus of everything in that sound stage is both tighter and possesses a three dimensional body that most digital simply lacks. Tone saturation is richer. The bass not only goes deeper, but is more tuneful as well. The highs are better defined and extended. The mid range is the icing on the cake. Voices are much better defined and clarified, combined with the improvement in density of tone and harmonic texture now sound shockingly real and alive. The sense of space and performance venue is greatly improved as well. Having used the new Evolution Signature mat for over two weeks, I can say that it has clearly increased my systems performance and my ability to further enjoy the music. Deeper, denser, saturated presentation. Music is fleshed out from a much darker background. Significant decrease in the feeling you are listening to digital versus high quality analogue.It’s interesting that you don’t know you have system “noise”, even at a very low level, until it’s gone. That’s exactly what this does and a lot more.